Well folks, if there’s one thing that’s true about the rumor mill it’s that when it rains, it pours. Just as we’re done covering one leak for the 2018 iPhone lineup, another one surfaces. Before we get into the details, it’s relevant to take a general look at everything that has surfaced on the lineup this year. Two of these, tentatively dubbed as the iPhone X(s) and iPhone X(s) Plus will feature a near similar design and aesthetic approach present on the iPhone X. The third, dubbed as the iPhone 9 will feature a 6.1″ LCD panel and attempt to persuade users with older iPhones to upgrade by featuring new color options and lower price tag. With these details in mind, take a look below for today’s second leak for the iPhone 9, iPhone X(s) and iPhone X(s) Plus. A while back, some interesting news from Apple’s supply chain came to light. Apple’s decision to use an OLED display for the iPhone X comes with an additional benefit in addition to improving overall quality. It allows Cupertino to curve the panel at the bottom, therefore removing the bottom bezel that’s generally required to house the display controller. However, with more rigid LCD panels, Apple does not have a similar advantage. Couple this with the need to keep the design consistent on the LCD iPhone with its OLED counterparts for driving up sales and Apple’s got a problem. The solution, according to recent news from the supply chain is in thinner LED backlight chips. Apple’s chips for the iPhone 9 are 0.3t, that will allow for a bottom bezel that’s 2m in height. 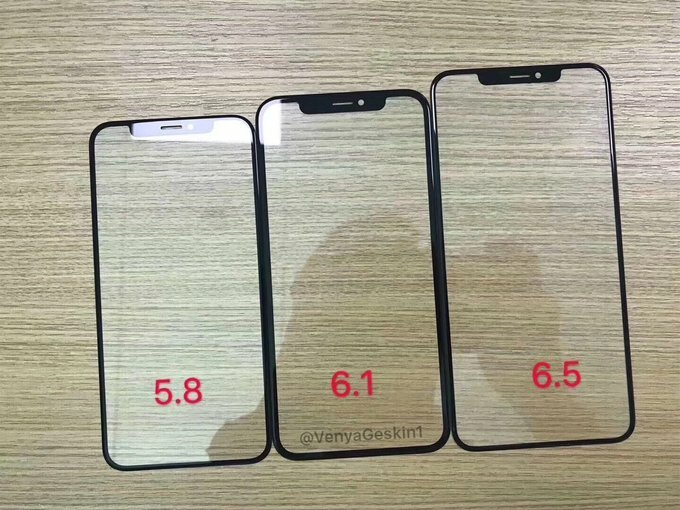 Today’s screen protector leak allows us to compare all three of 2018’s upcoming smartphones to see how much of a difference an LCD panel with thinner backlight chips will carry against OLED displays. Today’s leak (courtesy of Ben Geskin), provides us with a fresh look at some actual components for the three 2018 iPhones. Display panels for the trio confirm suspicions that Apple will introduce True Depth and an edge-to-edge, notched design for all three devices. They also allow a first, real-look at the bezels on the 6.1″ LCD iPhone 9, which are expected to bear the effect of an LCD display. 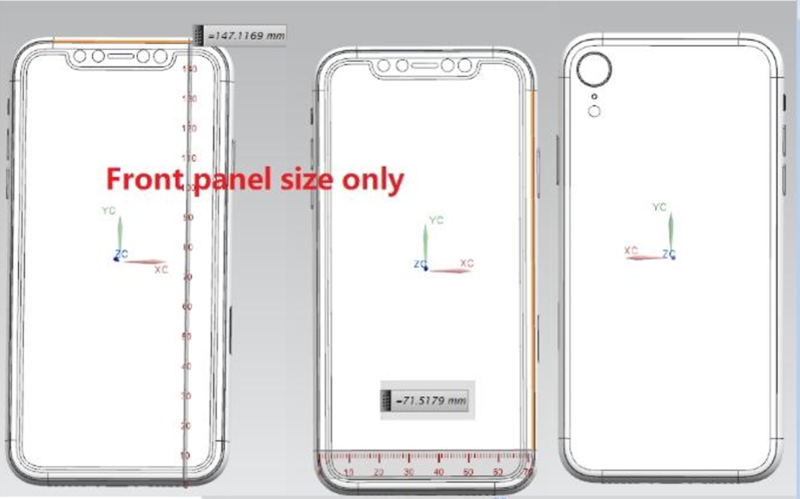 Judging by this, the bottom bezel on the iPhone 9 definitely appears to fall within the 2mm range. If this display panel leak is authentic, then Apple has managed to reduce the bottom bezel on an LCD smartphone nearly to the levels found on an OLED device – not a small feat. The effect is more pronounced at the top, where the bezel combined with the sensor cutout appears to have a more stronger look. But, this prominence is due to the background surface and shouldn’t be stark on the actual smartphone. The iPhone 9’s design will help Apple and definitely entice users who wanted to upgrade to the iPhone X but didn’t due to price or other considerations. The extent of this attraction will determine how successful the 2018 iPhone lineup is. Thoughts? Let us know what you think in the comments section below and stay tuned. We’ll keep you updated on the latest.